The 9th annual Juneteenth NYC celebration is set to draw over 3,200 people to celebrate the 153rd anniversary of “Freedom Day,” with a vendor marketplace featuring craft goods and food, community talent show, local small business exhibitors, health and wellness screeners, raffle prizes, plus a full day roster of live performances. Confirmed musical and dance performances will include New Wave Dance Youth and Community Development, Afrobeats Dance NYC, reggae artist Damion Anthony, soul vocalist Monique Brown, On Your Toes Dance Company, rapper Little Deuces, violinist Mikayla Tripp, a West African dance by Purelements: An Evolution in Dance’s COAR program ensemble, a Bollywood workshop by Ajna Dance Studio and more. Fun senior activities like aerobics by the Betsy Head Cardio Dance Aerobics group and child-friendly activations, games like African Mancala, Chinese jump rope, Indian Chor-Sipahi (American Tag) and music trivia for all ages. The 2018 Juneteenth NYC will be held (rain or shine) at Linden Park, located at Linden Blvd. & Vermont Street, Brooklyn, NY 11207. Activities begin at 11am until 7pm. Admission is FREE and open to the public. To RSVP, visit JuneteenthNY.com and on Facebook at Juneteenth NYC 2018. Attendees are invited to wear a culturally identifying to encourage cultural learning, sharing and community connections. To learn more about Umoja Events, visit umojaevents.com. 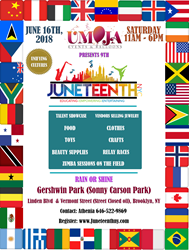 To connect with Umoja Events, visit the Umoja Events and Juneteenth Family Day Facebook pages, follow Umoja Events and the Juneteenth NYC pages on Twitter and on Instagram @UmojaEvents1 and @JuneteenthNYC. Follow the online conversation on the track with the hashtag #JuneteenthNYC.